We are back with this week’s best of beacons post. In this feature, we will cover some interesting news and updates, right from how MTR Crossrail is leveraging beacons to make an efficient rail service system to an interesting post on how beacons are fast reshaping retail spaces like the Regent Street. So, sit back and check out the latest stories from the beacon world. London’s Regent Street, home to more than 120 international brands and restaurants, has seen an increase in consumer engagement and in-store purchases after its adoption of a dedicated beacon-enabled mobile shopping app. The participating storefronts have seen offer redemptions via the mobile app increase tenfold and an engagement rate of 35% on offers pinged to nearby shopper. The Regent Street app essentially assists consumers in the planning of shopping excursions. To do so, the app relies on beacons to send alerts to consumers from boutiques and restaurants as they pass by. The app also aggregates exclusive and personalized content for shoppers based on user-generated profiles which are tailored by individual consumers’ preferences and likes. Here is a post that discusses how the Regent Street app is engaging customers effectively to increase customer engagement and to drive sales. Beaconstac has launched a new product update that introduces you to all new ‘Rules by Places’ and ‘Activity Logs’. Beaconstac customers could previously run campaigns based on a single beacon or multiple beacons through tags. Such granular campaigns assumed users to be in close proximity of a beacon and worked only when both the device and beacon were close enough to be paired with each other. But what if there are a few beacons spread over a physical space with a reach out to more visitors? Now, the new update Rules by Places aids in such scenarios. Additionally, updated Activity Logs allow users to get deeper insights such as when a visitor checked in a place, how much time they spent around various beacons and how long they stayed in a given place. Learn more about the new Beaconstac update in this post. By allowing places around a user, be it a museum or a retail store, to send contextually relevant notifications to him/her, Google has probably taken proximity marketing to a whole new level with Google Nearby Notifications. Built on the premise of enhancing customer interactions and experiences via contextually relevant notifications, Google Nearby Notifications has already got several brands and businesses excited. Businesses across the globe are exploring and investing in Google Nearby Notifications. For instance, HasGeek, the very popular Indian forum that promotes discussions and events on technology-related topics, leveraged Google Nearby Notifications via Beaconstac’s Eddy beacons at an recent event called ‘The Fifth Elephant’ conference. 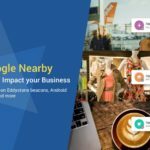 Read this post to learn about more such top Google Nearby campaigns and what you can learn from them. Milan Malpensa and Linate airports have launched an innovative, user-friendly beacon-enabled app to enhance passengers’ travel experience. The app, called ‘Milan Airports’, is powered by iBeacon technology to deliver personalised notifications, offers and discounts at the Italian airports. A number of airport apps are already utilising beacons for the same purpose, including launches this year at Hamad International Airport and Amsterdam Schiphol Airport. Of recent, JCDecaux Transport also used beacons for an advertising initiative at Hong Kong International Airport. Check out this post to know more about how beacons are making travel more interactive and exciting at airports. MTR Crossrail, the commuter railway line in London, is rolling out beacons across its network with an aim to deliver a highly efficient rail service. The main aim of the project is to provide station auditing and help railway drivers via several beacon-enabled driver apps. The project is believed to be one of Europe’s biggest deployments of iBeacon technology. The rail service company had started exploring the potential of using beacons for its rail network three years ago and launched a number of beacon-based applications. Now MTR Crossrail is deploying beacons across all 40 stations on the 118km Elizabeth Line to finally execute the plan. Check out this post to know more about how MTR Crossrail is using beacons. Businesses are increasingly becoming aware of the value that iBeacon technology holds. Many are utilizing the technology to go omni-channel, create efficient systems, obtain big data, boost sales, increase customer engagement, improve customer retainment, and much more. Experts believe that the global bluetooth beacons market is driven by retail’s high adoption and demand to provide customers with contextually relevant information and more. However, factors like lack of scalability, interoperability issues, security concerns and more are restraining the beacon market growth. Read this post to get complete insight about how beacon market is projected to grow.